The Cook's Tour: Food.Baking.Travel. 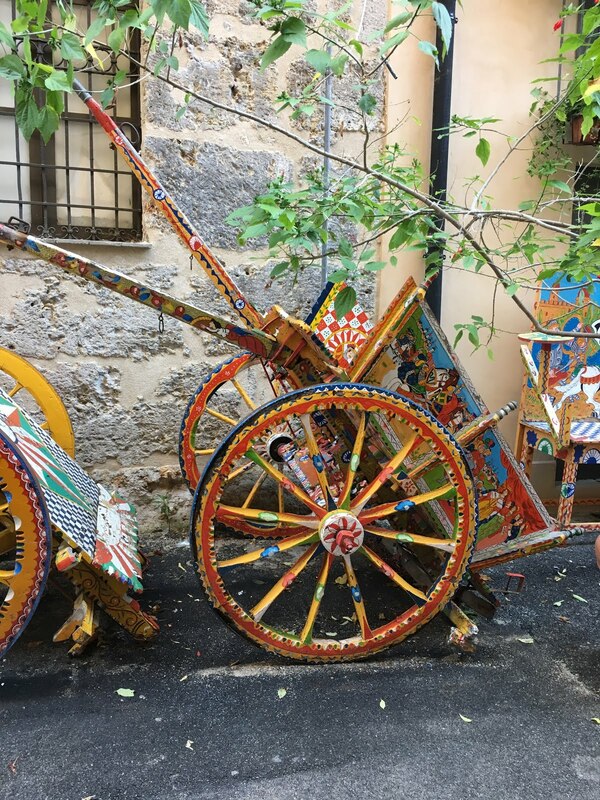 : Bella Sicilia! I hesitate to use the word “retirement” because I’m not retiring in the traditional sense. But I am retiring from this part of my working life. Many people have asked me “what will you do now?” The honest answer is, I don’t know. Travel is certainly on the list. Perhaps expand my passion for writing about food, baking, and travel. The slate will be wiped clean and ready for a new chapter! Listening to our trip leader and bus driver speak to each other in Italian (or Sicilian) with Italian folk music playing in the background as we traversed the island, this trip was a true cultural immersion. We flew into Palermo a day early and after settling into our hotel, we had dinner at a nice restaurant close by. 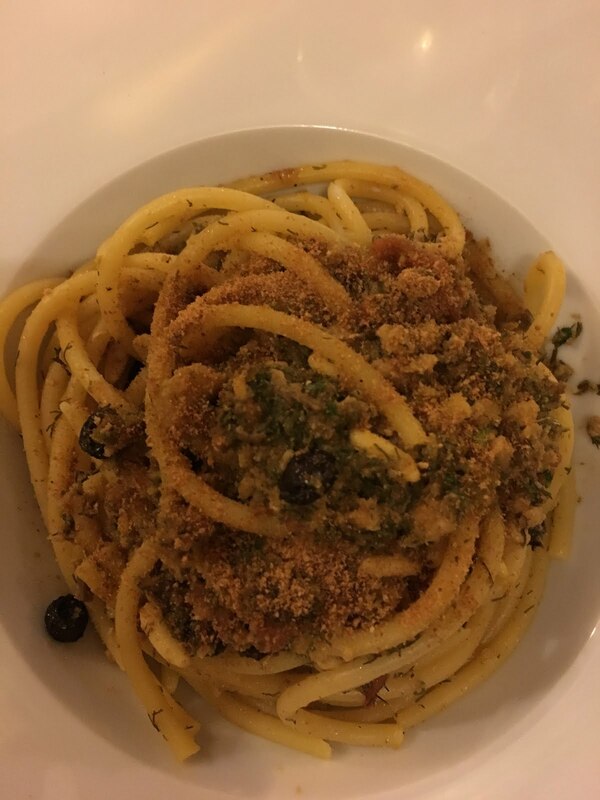 The photo at the top of the post is of the famous Sicilian dish -- pasta with sardines and fennel (both plentiful in Sicily). 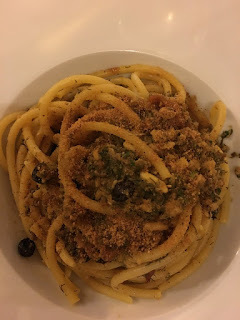 Made with fresh sardines and anchovies, and topped with toasted breadcrumbs, it is absolutely delicious and was the perfect first meal for our trip. 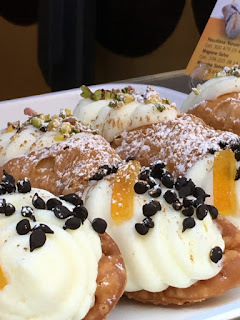 The next day we kicked off with a street food tour in the Sicilian capital. 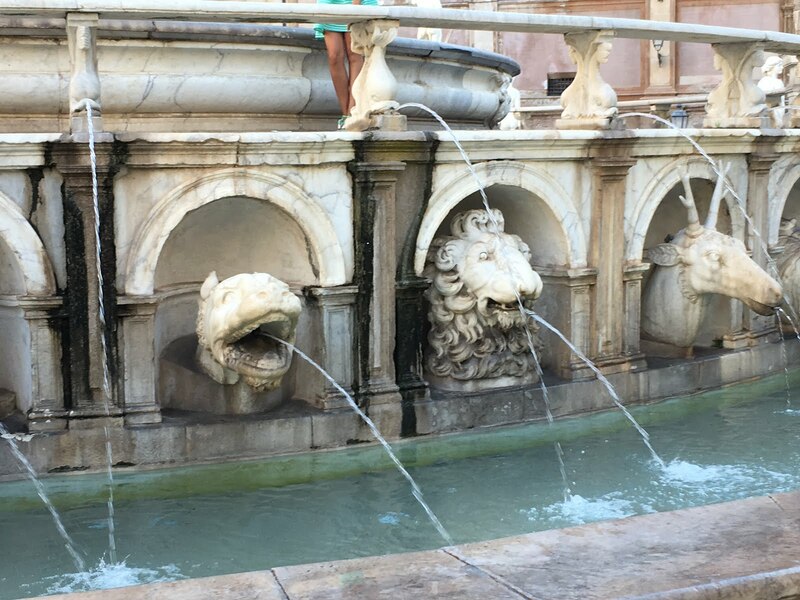 Run by Streat Palermo (not a typo, that is the name of the tour), this fun four hour tour walks in, around, and through the busy outdoor markets, all the while sampling delicacies (some of which are unique to Palermo), and learning about the sights along the way. Did you know that Palermo has 365 churches (for a population of 60 million)?! One for each day our tour guide told us. 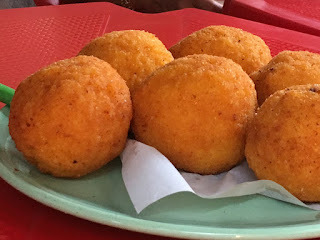 Not unique to Palermo (I’ve had them here in the US) are the wonderful little “arancino,” otherwise known as rice balls. These delicious treats can be stuffed with ground beef, peas, and cheese. You may notice the absence of tomato sauce from that description. That’s because authentic Sicilian rice balls omit it. 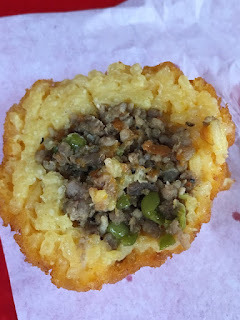 And, interestingly, they can be referred to in two different ways: “arancina” (female), or “arancino” (male, from the Arab influence prominent in Sicily’s history). 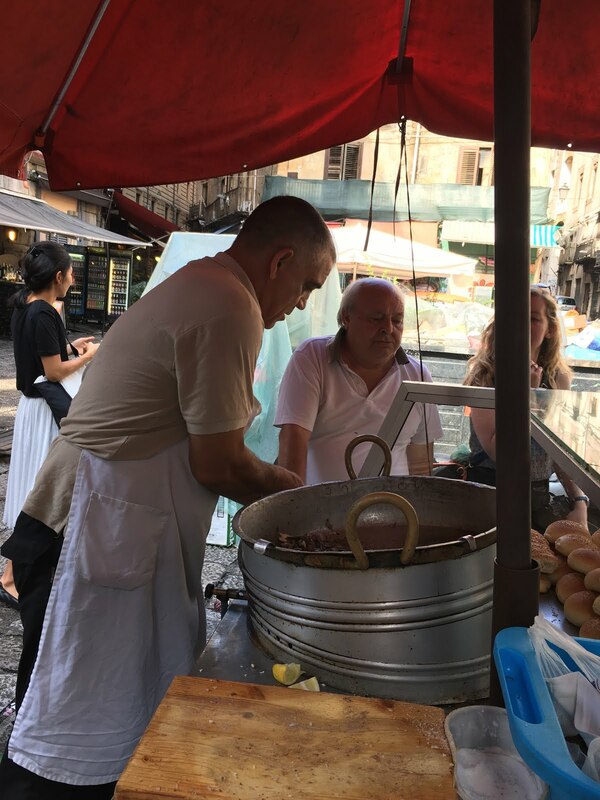 BTW: Palermo has the third largest concentration of street food in the world (after China and India). Who knew? 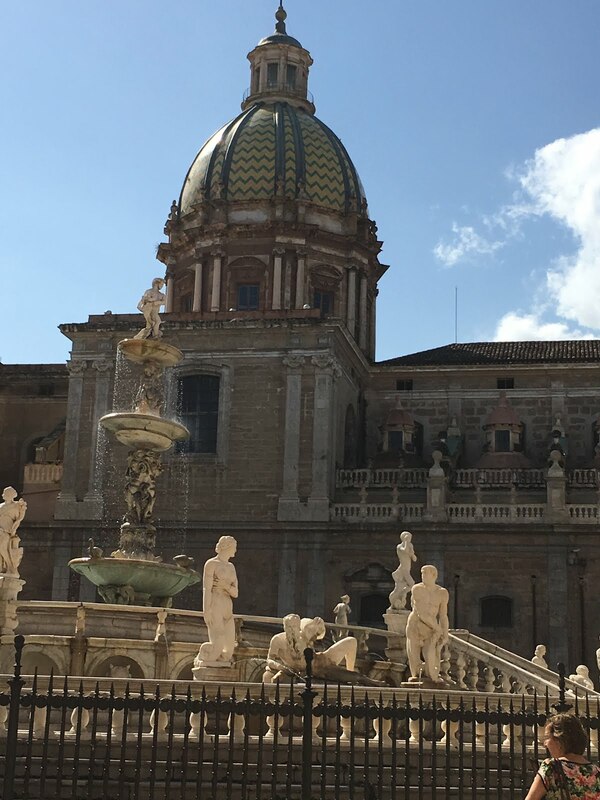 On our way to our next taste destination (addictive chickpea fritters), we stopped at Monreale Cathedral, built in the 12th century by King William. The cathedral took 30 years to complete and includes 4,000 pounds of mosaics! In fact, this is the largest display of Byzantine mosaics in the world. 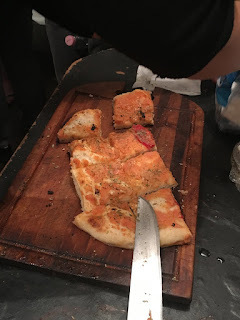 Another delicious legacy from the early Arabs, is “sfingone,” roughly translated means “sponge.” Here on the East coast of the US, we would recognize this vaguely as Sicilian pizza. Thick, soft squares of tomato, caciocavallo cheese, breadcrumbs, and onions. 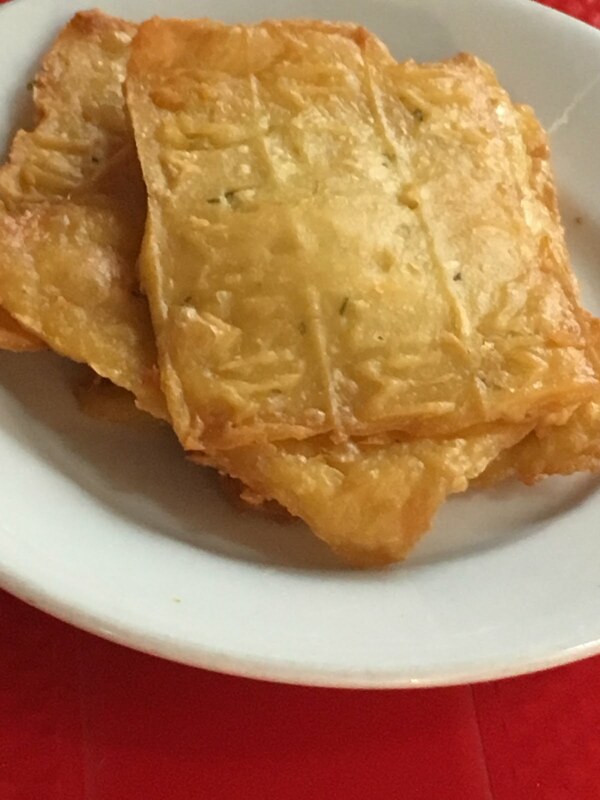 There is one producer in all of Palermo who makes the dough and then individual vendors season it and toss it on a flattop griddle to warm it. 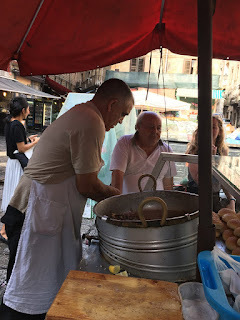 If you’re doing a street food tour in Palermo, eventually you are going to come across a sandwich known as “pane ca’ meusa,” (bread with spleen), or “frittola” (butcher waste). Not a very appetizing description. Developed ages ago by enterprising Palermitanos (who waste nothing) after Kosher Jews discarded certain organ meats (spleen and lung), this is one of those things I think you either love or hate. The cooks slice the meat paper thin, fry it with olive oil, bay leaves, and cheese, season with salt and pepper, and serve it on a brioche roll. Well, I was there so I had to try it. Let’s suffice it to say, I am not in the “love” camp. I can’t even describe the taste. It was so unappealing to me, I didn't even take a picture. Enough said, let’s move on, shall we? After our adventures with animal organ meats, we were in desperate need of a “digestivo.” Luckily, our guide, Francesca, had just the ticket. 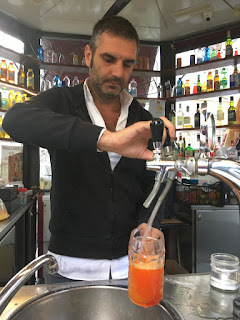 At a kiosk, the handsome man behind the counter makes fun drinks (alcoholic or non) for people on the go. He mixes orange or lime syrups, water, and just before you drink it, adds a fizzy tablet to make it bubble up. The trick is to drink the whole thing before the fizz evaporates (and without it exploding all over your clothes) - no easy feat! But it definitely gives your stomach a much-needed break. 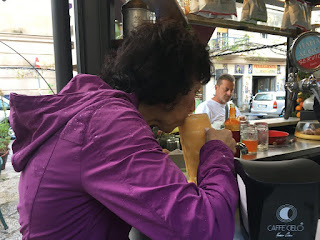 And, as Francesca told us, it is not considered bad manners to burp out loud after drinking it! 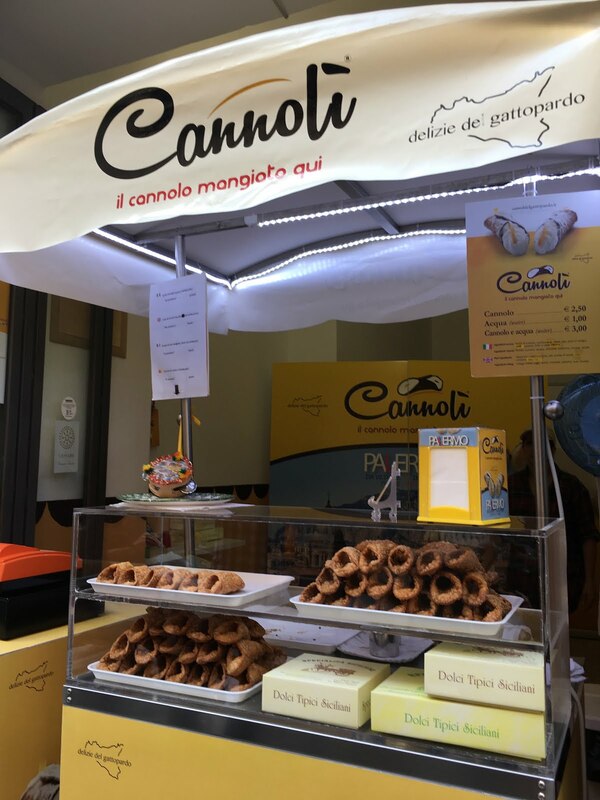 From there, we headed directly to the crown jewel of this tour: cannolo! Again, not a typo. A singular pastry is known as a cannolo, more than one is cannoli. This is now the cannolo by which all cannoli shall be judged! With a shell so crisp, it shattered into a million pieces when I bit into it, and filled with fresh, fragrant ricotta sprinkled with crushed pistachios, candied orange zest, and chocolate chips, it was magic! All this history and food and our actual two week tour had not even begun yet. I had a feeling this vacation was going to be epic, for many reasons. 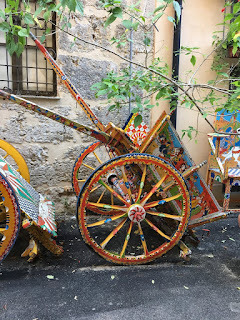 Tomorrow, part two, in which I’ll take you with us as we start the official trip and visit the beautiful towns of Castelbuono, Cefalu, Erice, and more! 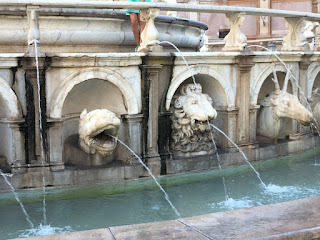 And you won't want to miss reading about our lunch at the fabulous (two Michelin star) Duomo in Ragusa!